I love my plants. I really do. I've been playing with succulents lately. I love propagating and repotting my plants - it gives me a bunch of warm motherly feelings. So, like any mother, I'm sharing some pictures with you. First, my little collection outside my window. 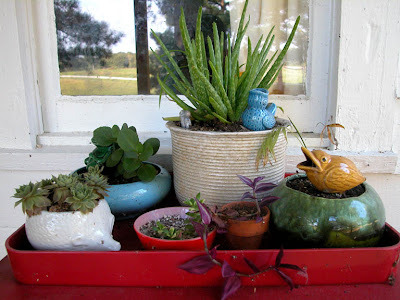 We just bought the Aloe plant, and this time I will remember to bring it in before the frost. You can see a couple of my little antique watering spikes. Have I mentioned these before? John bought me the bluebird first, and we've been hooked on them ever since. The purple vine is a Wandering Jew that my sister gave me maybe eight years ago. I've almost killed it a dozen times, but it always comes back. 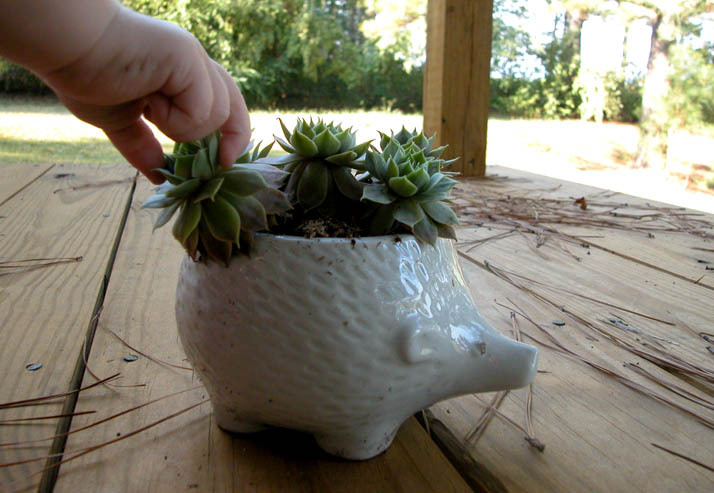 I planted these spiky Hens and Chicks in my hedgehog planter, and feel pretty clever and satisfied for it. Don't touch, J! By my other window is my large Jade plant. It was my grandmother's so I'm trying really hard to take care of it. In fact, it was the reason I started learning about succulents. The poor little Fitonia next to it used to be one of my favorites, but I just about killed it from over propagating it. Oops. I'm hoping to bring it back. 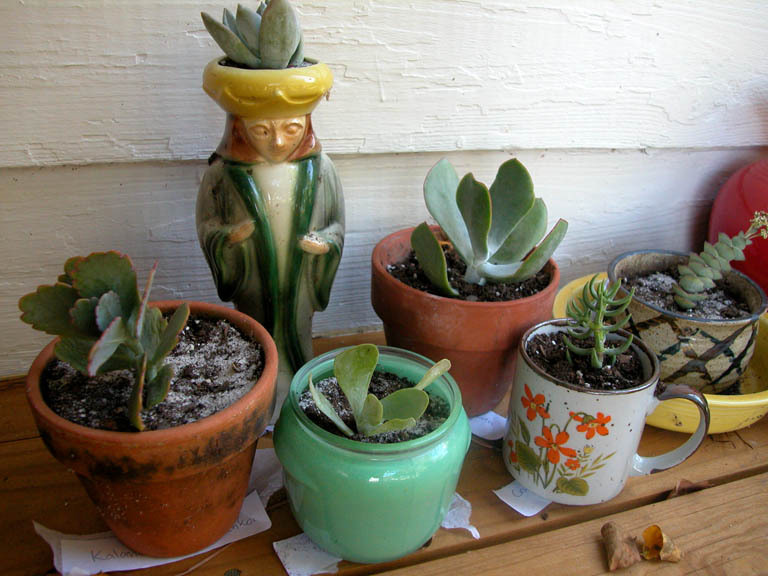 These are some new cuttings I just purchased from The Succulent Garden on Etsy. They feel like tiny little babies that I get to raise. Which is what they are, but, you know, I mean it anthropomorphically. Don't you just love that vase? He looks very regal. We got it at an antique place, but we don't really know what it is. Do you? 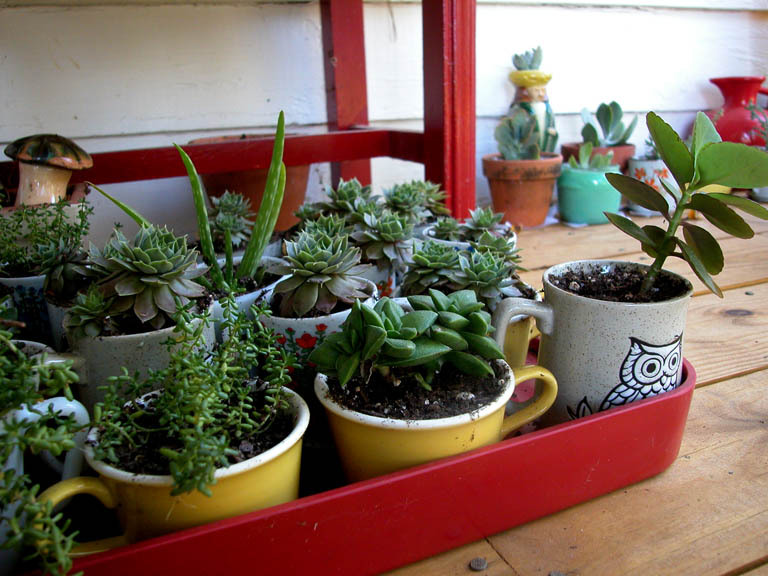 And here are some little cuttings I'm propagating into some old tea cups to sell at a craft fair later this fall. I hope to sell them all because I definitely don't have enough window space for all of these plants this winter! Pretty sure that guy is Jesus. 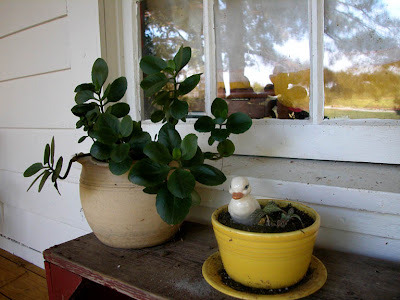 Very cool stuff, we can't seem to keep houseplants alive since we bought the farmstead though. We had the most beautiful greens when we lived in town though. Kind of ironic! ha, we thought it might be something religious, but I didn't think it was Jesus since he's usually depicted with a beard. Doesn't quite look like anything else I've seen.